If everything goes according to the plan, opening up of Kartarpur corridor for visa free travel of Sikh pilgrims to the holy place, where Guru Nanak Dev Ji had settled along with his family after his travels and where he left his mortal form, will become a reality within the next few months. 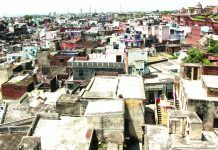 Thus, what was proposed for the first time by the then Prime Minister Atal Bihari Vajpayee in February 1999, when he took a bus ride to Lahore during a peace initiative with Pakistan, will become a reality. 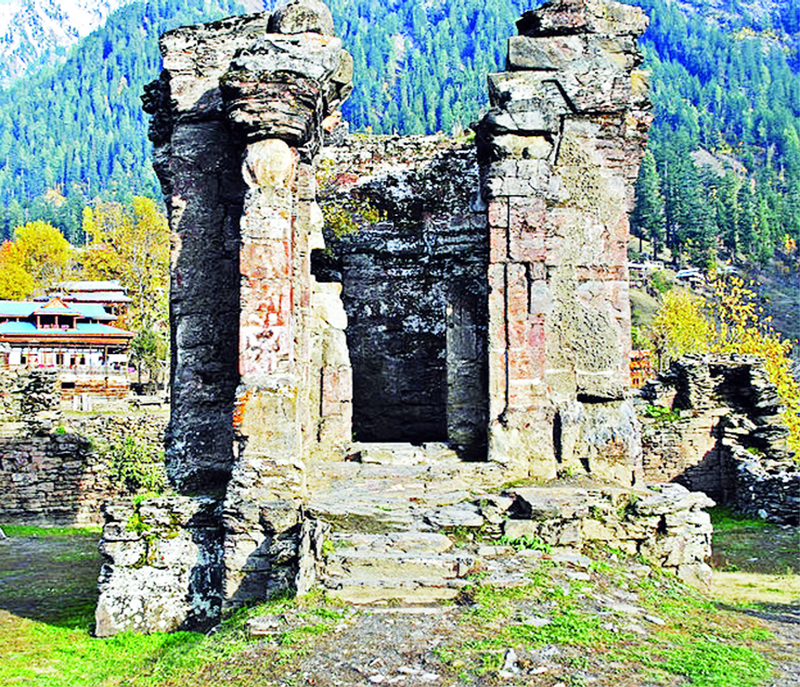 The demand for the opening up of Sharda Peeth, a holy shrine for all Hindus, Kashmiri Hindu community in particular, in Pakistan-occupied Kashmir (PoK), for pilgrimage had been there for a long time. Now, the Pakistan Government has approved a proposal to establish a corridor that will allow Hindu pilgrims from India to visit Sharda Peeth, an ancient Hindu temple and cultural site in Pakistan-occupied Kashmir, according to a media report. 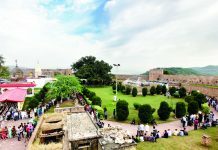 The Sharda Peeth corridor, when opened, will be the second religious tract after Kartarpur corridor in Pakistan-controlled territory that will connect the two neighbouring nations. Sharda Peeth is located at PoK’s Sharda village in the Neelum Valley, 207 kilometres north of Muzaffarabad (capital of PoK). 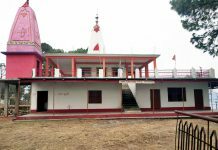 The Sharda temple is located near the confluence of Kishan Ganga river and Mudhumati stream. Although the exact date of establishment of the temple is not known, however, it is believed that the present style and form of the shrine was given to it by King Lalitaditya in 724 AD. Sharda Peeth, which has been out of bounds for Indian pilgrims since Partition in 1947, was once regarded as a major centre of higher learning of Vedic works, scriptures and commentaries. One of the 18 highly revered temples across South Asia, it was once considered at par with the ancient seats of learning at Nalanda and Takshila. 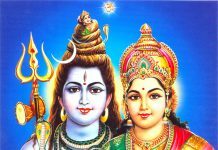 In Hindu mythology, it is also believed that Sharda Peeth is the place where the right hand of Sati’s corpse fell while being carried by her husband Lord Shiva. A temple of Saraswati, the goddess of knowledge, it was also here that the Sharda script, once quite popular in north India, originated. Yatra to Sharda Peeth flourished during Maharaja Ranbir Singh’s period and later Swami Nand Lal Ji was the last saint who lived here even beyond partition till 1948. There were 23 Kashmiri Pandit families in Sharda village which is a Tehsil now alongwith another Tehsil called Athumuqam in District Neelam. The temple currently does not have any idol of Sharda. It is said that there once was a wooden idol in this temple which was later replaced by a stone statue that looked like the Sharda idol brought to Sringeri, Karnataka, by Adi Shankaracharya. In this idol, the goddess has four arms where she holds a parrot (symbol of Parvati), a pot (symbol of Laskhmi), a book (symbol of Saraswati) and the gesture indicating transmission of knowledge in the fourth hand. “The greatest knowledge we can hope to get from Sharda is perhaps the ability to appreciate the violence of the past without letting it upset the peace of the present, and the future”. The demand for allowing pilgrims to visit the temple from the Indian side gained momentum in 2007, following a visit by Prof. Ayaz Rasool Nazki, a Kashmiri scholar and former Regional Director of the Jammu & Kashmir chapter of the Indian Council for Cultural Relations. After his visit to Sharda Peeth, Prof. Nazki made an audio-visual presentation at a Seminar at New Delhi and voiced his desire to allow pilgrims to visit the holy shrine. 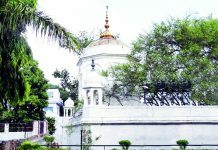 Nazki says that one of the legends associated with the shrine is that, during the fight between good and evil, Goddess Sharda saved the container of knowledge and hid it in a hole in the ground at Sharda. She then turned herself into a structure to cover the pot. The structure now stands as Sharda Peeth. The Save Sharda Committee, which has been spearheading the campaign to allow Kashmiri Pandit pilgrims access to Sharda temple, has petitioned the Central Government, and also written to the Pakistan Prime Minister in this regard. 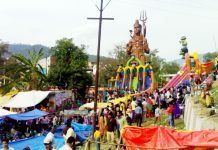 Ravinder Pandita, who heads the committee, has described Sharda as “our kuldevi, the principal deity for Kashmiri Pandits”. He has also been successful in establishing contact with the people living in Sharda village in PoK, who, he says, are looking forward to receive pilgrims from across the LoC. * There already exists a system of Visa-Free travel between Srinagar and Muzaffarabad in Kaarvan-e-Aman, the bus service which runs a distance of 170 kilometres between the two places. The bus service was officially launched on April 7, 2005 and was flagged-off by the then Indian Prime Minister Dr. Manmohan Singh. 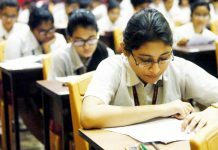 However, the service can currently only be availed by J&K State Subjects with the purpose of meeting their relatives across the Line of Control. The scope of this travel needs to be broadened in order to include Hindu pilgrims desirous of performing the pilgrimage to the Sharda Temple. Currently, all prospective visitors have to apply at the Regional Passport Office at Srinagar, which is the designated authority to evaluate applications, verify identities and issue entry permits. There is a need to authorise Regional Passport Offices at Jammu and New Delhi to process the applications of Hindus, desirous of performing the pilgrimage, because after their forced exodus from Kashmir Valley, these are mainly the two places where Kashmiri Hindus have settled. Hindus from other parts of the country can also be allowed to visit Sharda Peeth on the same lines as Hindus are permitted to visit Katas Raj and visas are issued to them by Pakistan High Commission at New Delhi for performing the pilgrimage. * The temple is currently without a deity. Therefore, the original Sandalwood idol of Sharda, which was reportedly carried by Adi Shankaracharya from Sharda to Sringeri, where it is revered as Shardamba, needs to be brought back and re-installed at this temple. The Shardamba temple in Sringeri was built in the 8th century by Adi Shankar-acharya. The temple housed the sandalwood idol of the goddess which was installed by Adi Shankaracharya. Later, it was replaced with a gold idol of the goddess. The original idol of Sri Shardamba (Sharda) in sandalwood has been moved and is now housed in the temple of Sri Vidyashankara at Sringeri. Efforts are required to be made to retrieve this idol from Sringeri and install it at Sharda Temple after performing the ceremony of Murti Pratishtha. In case that’s not possible then a new idol needs to be prepared, in consonance with the available details regarding the original idol. * The road from Muzaffarabad to Sharda is as good or as bad as the roads in the entire rural landscape across the Pir Panjal and Kashmir region on both sides of the LoC. The road needs further improvement in order to facilitate smooth travel of the pilgrims to the temple. * There appears to be adequate accommodation available in the form of Tourist Huts, Rest Houses and private hotels in Sharda to accommodate small contingents of pilgrims. A realistic assessment needs to be carried out in order to ensure adequate accommodation for the pilgrims. 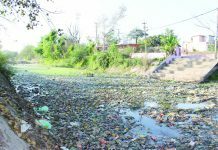 * The approach path from Sharda village to the Temple is in a very bad shape (as seen in some recent videos uploaded by visitors on YouTube). This needs to be repaired in consultation with the experts in archaeology. 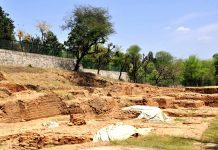 * The official website of Tourism and Archaeology Department of PoK describes this site in just one line as “In sharda, one also finds ruins of an old Buddhist Monastery and a fort which are of historical back ground”. Strangely, 38 FF Regiment (SANGEE) has done a much better job than the Archaeology Department in compiling, in March 2015, the history of this site which is displayed in the form of a Signboard at the site (Seen in videos uploaded by visitors on YouTube). The Sharda temple is currently being treated only as an archaeological site. Therefore, people are seen walking in their shoes and smoking inside the precincts of the temple (Seen in videos uploaded by visitors on YouTube). 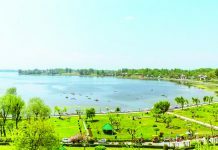 Ravinder Pandita, Head and Founder of Save Sharda Committee, Kashmir has recently reported that responding to his request, the Director General, Archaeology and Tourism, PoK has issued orders to the effect that the visitors need to remove their shoes before entering the premises. This needs to be further emphasised upon considering the sentiments of the devotees associated with this holy shrine. It should not be a difficult task to achieve as I have personally witnessed many Temples and Gurudwaras in Lahore and Karachi being maintained with the sanctity and reverence associated with all holy places. * There is a need to ensure fool proof security for the pilgrims because there is no dearth of elements who do not want the relations between the two neighbouring countries to improve. In conclusion, it can be said that opening up of Sharda Peeth Yatra for pilgrimage can prove to be one of the biggest confidence building measures between the two nations. This will bring the two nations closer to each other and help in ushering in an era of peace and prosperity in the entire region. 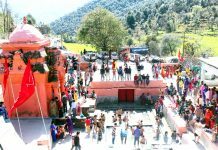 In case the process of opening up the Yatra is fast-tracked, it is very much in the realm of possibility that the first batch of pilgrims will reach Sharda Temple on Bhadra Shukla Paksh Ashtami, which is the day when Kashmiri Hindus traditionally used to perform the Sharda Peeth Yatra. This year the day falls on September 6, 2019.